Break out the tents, sleeping bags, winter coats, umbrellas, rations, and probably a bag for bodily fluids – because Black Friday is days away. The lines and campers are a staple and we are here to break down some of the deals gamers can find, as well as some online alternatives for those that do not want to wait in lines while celebrating Turkey Day as a game of patience. We are starting things off with a *BANG*! You know that mysterious Steam Sale that happens almost predictably random-like? Well, the official word is the Steam Sale will happen around November 27-28! According to a Japanese ad HERE and people bursting about it on Reddit, Steam is ensuring we never finish every game purchased in our archive. The next deal is not new by any means, but it is the top, most wanted item on everyone’s list on Black Friday. 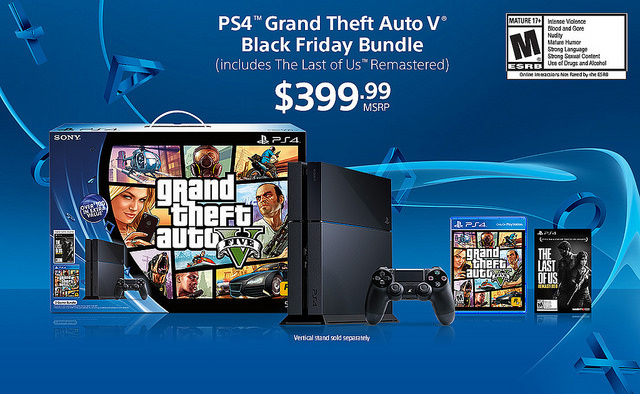 The Sony PlayStation 4 Bundle with Grand Theft Auto V and The Last Of Us Remastered for $400. Two fantastic games from the last-gen and brought over to entertain us again with more shine and slight facelifts. The most coveted prize for gamers on Black Friday. Supplies are limited, so stay safe from stampedes when pursuing. For Black Friday Ad snoopers, BlackFriday.com and TheBlackFriday.com lists all of the leaked deals and goodies available once the doors bust open on ThanksGiving. Yes, we are saying on ThanksGiving since it is what most retailers have resorted to in order to compete with each other for profits. We are not going rant about our disapproval of this trend, so to all of those that have to work on ThanksGiving, you have our empathy. Now, onto some of the highlights of this year’s Black Friday sale that we approve of and are hyped about. Check the list out down below. As always, safety first. It’s cliche, but please do not put yourself in a situation that could lead to being harmed in any way for inanimate objects. Yes, there are great deals out there, but saving a some bucks will never be worth spending hundreds on medical bills. Stay safe, good eatin’, Happy ThanksGiving, and hope you all obtain the Black Friday goodies on your list!